What’s a mountain climber to do once he or she has summited the Adirondack Forty-Six, the Catskill Thirty-Five, and the Northeast 115? Create a new list, of course. And so we have the Adirondack Hundred Highest—the obsession of hard-core hikers who don’t mind surrendering a few pints of blood in their quest to stand atop the region’s tallest mountains. The Hundred Highest includes the forty-six High Peaks first climbed by Bob and George Marshall and their guide, Herb Clark, in the first quarter of the last century. All of these peaks now have marked trails or obvious herd paths, so climbing them is not as difficult as it was in the Marshalls’ day. Not so with most of the other fifty-four of the Hundred Highest. Thirty-nine of these peaks lack trails. Climbing them entails bushwhacking up streambeds, scrambling over or under fallen trees, and pushing through phalanxes of spruce that guard the summits. 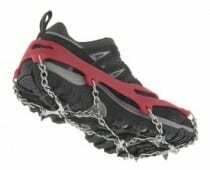 Those who undertake such a trek can expect to be poked, scratched, bruised, and bitten. It’s not for inexperienced hikers. 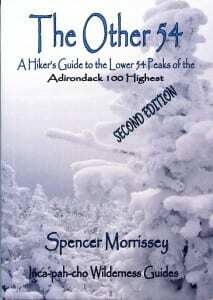 In 2007, Spencer Morrissey wrote a guidebook titled The Other 54 for adventurous souls aspiring to join the Hundred Highest club. He estimates that only forty or so people have done all the peaks. Those who qualify can request a patch from the Hundred Highest website. Morrissey sold all 2,500 copies of the first edition of The Other 54 and has just come out with a second edition, which he published under his Inca-pah-cho Wilderness Guides imprint (the name derives from the Algonquin name for Long Lake, Morrissey’s hometown). It remains the only guidebook available to bushwhacking the pathless peaks. The second edition updates trail conditions, describes several additional routes, and corrects many misspellings and grammatical errors (full disclosure: my son was the copy editor). 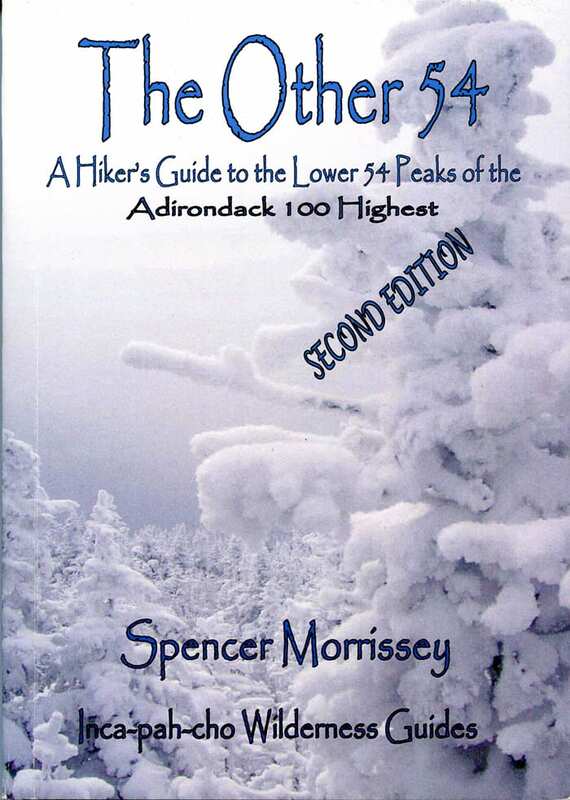 In an improvement over the first edition, Morrissey arranges the chapters (one per peak) geographically rather than by the heights of the summits. 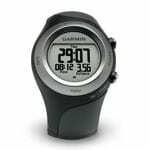 This makes it easier to plan multi-peak treks. He could have made things even easier, though, by dividing the book into regions and including locater maps. Most chapters include at least one black-and-white photograph. All include a topographical map showing the various routes to the summit. In the first edition, all the maps were grouped in a color gallery at the back of the book. The current layout is more convenient, but the tradeoff is the maps are black and white. One odd feature is that Morrissey repeats directions unnecessarily. In the chapter on Lost Pond Peak, for instance, he describes four routes to the summit, all starting on the same trail at Adirondak Loj. Instead of providing the driving directions once, he repeats them at the start of each route description. Likewise, sections of the route descriptions are repeated. It’s like déjà vu all over again. Given the author’s enthusiasm and sense of humor, it’s easy to forgive the book’s shortcomings. Besides, whatever its flaws, The Other 54 is essential equipment for Hundred Highest aspirants. A more serious criticism (whether justified or not) is that the book will lead to environmental degradation on summits that are now pristine, just as the Forty-Sixer craze led to the creation of herd paths. “You simply can’t have thousands of people doing this, or even hundreds, and hope to maintain the resource or wilderness qualities of this place,” says Jim Close, an avid hiker who has climbed the Hundred Highest himself. Since the Marshalls, more than seven thousand people have climbed the Forty-Six. They were rewarded with grand vistas on most of the summits. One wonders how many of these hikers would have wanted to endure an arduous bushwhack up Sawtooth No. 5 for a glimpse of the horizon through the trees.